The Bower packages are listed in the bower.json file. lib: "./" + project.webroot + "/lib/"
clean - uses a force clean to delete everything in the wwwroot/lib folder (rimraf is a npm package which recursively force deletes all files in the target folder, equivalent to the rm -rf command). copy - runs a clean first and then copies the scripts from their Bower package location to the wwwroot/lib/NAME folder, where NAME is the left hand of the bower json object. In order to use our own files with Gulp we need to modify the Gulp task or write a new one. There are good guides on using Gulp to build a pipeline. This blog post isn't one of them. The . is the project root. // Copy all project scripts into the lib folder. This takes all my scripts from the source (./Scripts folder), it then pipes them into the destination operation which writes them into the ./wwwroot/lib folder. 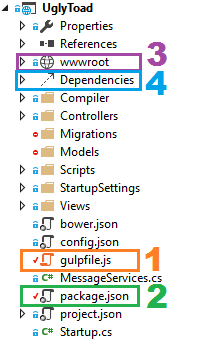 Note - if the scripts don't show up, look at the lib folder in the Windows File Explorer; Visual Studio sometimes doesn't show the copied Gulp files. Now we'd like to minify these files, luckily for us we can add a step to our streaming operation.